Thanks for joining us today, Jessica. I loved your story, and I know all your readers will, too. Melanie: Romance, Oregon is a beautiful place with a small-town atmosphere and big personalities. If you could visit Romance yourself, what one shop or person would you want to make sure was on your itinerary? Jessica: Just one? I'm going to have say Uncle Earl would be the top of my must-meet list. He is such a fun character and has that way of being both sage and ornery at the same time. Melanie: Animals are a big part of the stories that make up our Fall Into Romance compilation. Tell us a little about the critter(s) in your novella. Jessica: When I was first invited to take part in the Fall Into Romance boxed set, Chance was the first character who galloped into my head. He's a beautiful buckskin gelding who has some trust issues. But Katie's not going to let that stop her from loving him. I also knew I wanted dogs in the story, because I love dogs. So Katie has a dog Loverboy and then adopts the timid Roxette. And yes, those names do come from their classic rock counterparts. I didn't originally plan on Mike adopting any animals, but since he lives a little outside town, a mouser was important. Unfortunately, Pooka was not the mouser he was hoping for. He then goes back to Finding Forever and adopts Puppy the cat to be Pooka's trainer. Melanie: Which of the characters in your story do you relate to the most? Why is that? Jessica: Hmmm, I relate a lot to Katie because she shares a lot of personality traits with me. But I think I relate most to Aunt Viv. She's a spunky woman who always has a little mischief up her sleeve. But she also has a way of being tender and loving when needed. She likes to tease and is the perfect companion to Uncle Earl who would live a very boring life without her. Melanie: What’s your favorite snack food or drink to have on hand when you’re writing? Jessica: When I'm writing, I have to have chocolate. Whether in candies or hot cocoa, I love to have chocolate with me while I'm working. It works well as motivation when the words are coming slow. I have to be sure to hide it though or my children would steal it all away. Melanie: If you’ve been to Oregon, what did you like best about the state? Jessica: It's been a long time since I had a real visit (I don't suppose driving over the Snake River into Ontario just to say I've been in Oregon counts), but I remember it being beautiful. It was September when I visited and the trees were just starting to turn. I'm definitely going to have to make another trip out there at some point. ​Melanie: What was your favorite part about writing your novella? Jessica: Uncle Earl and Aunt Viv, hands down. They made the story so much fun between their teasing and the way they love Katie with all their hearts. I had so much fun writing snippets of their relationship and seeing into their personalities. Melanie: If you could have any animal as a pet, what would it be? Jessica: Like Katie, I love horses. Someday I hope to own a couple myself. In the meantime, I'll let my characters own the beautiful horses I wish I had. Melanie: What state do you live in? What’s the weather like there in the fall? Jessica: I live in southwest Kansas and love the fall here! Fall means harvest, which can be challenging for my little ones' allergies, but it also means the prairie changes color. It's such a breathtaking sight to see the grasses turn orange and gold, especially when we've had a good, rainy year. Fall tends to still be pretty warm, but snow can start falling as early as October. For as long as she can remember, Jessica L. Elliott has been telling stories. As soon as she could grasp a pencil she began writing those stories down. Reading fueled her imagination, as did spending time with her five younger brothers and sisters. Everything was an adventure, something to be treasured and stories were her first love. Jessica specializes in stories filled with fun, adventure, and romance. Katie Mackall broke up with high school sweetheart Mike Elders when his decision caused a deviation in their plans. Five years later, he returns to Romance and she can't seem to shake him. When Mike comes to her rescue, Katie must decide if she's going to let go of her lingering doubts and give her heart the lead. Mike never forgot Katie, and when he accepts a teaching position in Romance, he hopes to have a second chance with her. But their complicated past, and a PTA mom who won't get out of his way, doesn't make it easy. An instant connection with Katie's new dog may not be enough to win her heart, but determination and patience, with just the right touch of romance, might. Fall Into Romance - Pre-Order for Only $0.99! Katie's Chance for Romance by Jessica L. Elliott is one of ten sweet novellas in the Fall Into Romance collection. Surround yourself in the romance of the autumn season with 10 heartwarming, sweet novellas from the USA Today, national bestselling, and award-winning authors. Each story takes you inside the heart of a small town-its people-and features adorable animal friends in need of a forever home. Take a trip to Romance, Oregon, where falling in love has never been easier and happily-ever-after is guaranteed! Happy Wednesday, everyone! I have a free book for you all. Calming the Storm is free through September 1st. This was my debut novel, and it's still one of my favorite stories. I hope you enjoy reading it as much as I did writing it! A marriage of convenience isn't exactly what she had in mind. After a rocky start, Rachel Peters finally has her life on track. Then a tragic accident takes away her sister and leaves her to raise her niece, Kendra, alone. About to lose custody of her last blood relative, Rachel is desperate to prove she can adequately care for her niece. On the verge of running away to keep Kendra, a new friend offers Rachel an opportunity she can't refuse. Brandon Barlow has long admired Rachel. When her world begins to fall apart, he feels led to help. A marriage of convenience would enable him to provide Rachel and Kendra with a stable place to live, proper health insurance, and a viable shot at staying together. Once Rachel gained full custody of her niece, the marriage could be annulled. His plan provides the perfect solution, until Brandon realizes he's fallen in love with Rachel. Through love and patience, can he help Rachel realize that, even when she experiences storms in her life, she's never alone? Hi Shanna! I'm so excited to have you on my blog today so we can chat for a bit and talk about your novella. Thanks for coming! Shanna: Do I have to pick just one? If so, I think I’d visit Finding Forever Animal Rescue because it’s central to all the stories in Fall Into Romance. It would be fun to see all the animals. If Captain Cavedweller went with me, we’d definitely come home with a new pet. If I could pick more than just one place to visit, I’d stroll around the town square because in my head, it’s just a lovely place to hang out. I’d also visit the Sweet Retreat gift shop and Pages of Romance bookstore then enjoy a piece of pie at Della’s Diner. Shanna: In Blown Into Romance, Brooke Roberts has never stayed in one place long enough to set down roots. She decides to settle in Romance and what better way to make it home than to adopt a pet. Only, instead of adopting one pet, she adopts a mama pot-bellied pig and four piglets. Winnie the Pig (the mama) quickly wins Brooke’s heart, as do her adorable offspring, appropriately named Roo, Tigger, Robin, and Eeyore. Tigger proves to be a bit of an escape artist, and Roo is the little runt of the litter (and may be my favorite, but don’t tell the others). The piglets were such a fun addition to the story, even if they did make rather unusual pets, especially for a woman who has a store full of beautiful, breakable glass works of art. Shanna: I probably relate more to Blayne Grundy (the hero), than Brooke, just because Blayne grew up on a ranch, knows all about living in small towns, and is someone who tries to always do the right thing. But I love Brooke’s creativity and her willingness to open her home and heart to the little family of pigs. Melanie: What’s the most unique pet you’ve ever had? Shanna: A calf named Blackie. I bottle-raised him and he thought he was a dog for the longest time. He’d follow me everywhere. I’d whistle and he’d come. Shanna: I’ve lived in Oregon all my life except for a few months when I moved to Arizona for a college internship. I think one of the most incredible things about Oregon is the diversity of the landscape. So many people picture lush green forests when they think of Oregon, but the state has so much more than that. The Northeast corner is filled with rolling hills of wheat, apple orchards, and vineyards. The Southeast section features desert landscapes and vast open spaces. Central Oregon has spectacular rock formations, winding rivers, and outdoor activities galore. The Southwest corner is dense with forests (Crater Lake, anyone). Around Portland, you’ll see those lush forests, but drive a few hours west and you’ll discover the amazing and rugged Oregon coastline. Melanie: What was your favorite part about writing your novella? Shanna: Being able to work with this great group of authors and create the town of Romance and all these fantastic characters was definitely my favorite part of writing the novella. When we first started the project, I never dreamed we’d have so much fun! Melanie: If you had to describe the town of Romance with one word, what would it be? Shanna: Home. I think the one word that best describes Romance is home. Yes, it’s a small town where everyone knows everybody’s business, but it’s a warm, welcoming community that gives people a place to belong and makes them feel loved. Isn’t that what home is all about? Melanie: Coffee, hot cocoa, or tea. Which do you prefer during the fall and winter? Shanna: Tea! I’ve never liked coffee, and, unfortunately, drinking unlimited cups of hot cocoa disagrees with my testy scale (or maybe the person weighing on it is the testy one). So I stick with tea. During autumn, I like to drink pumpkin spice tea, then during the holiday season, I have Christmas-flavored teas. The rest of the winter, I drink peppermint tea. Melanie: There are a lot of wonderful pumpkin-flavored treats at the Fall Festival in Romance. Do you like pumpkin? If so, what’s your favorite pumpkin-flavored food? Artist Brooke Roberts spent her life without roots, wandering from town to town. When she seeks refuge from a freak storm in the town of Romance, she decides to stay and open a blown glass studio. Determined to immerse herself in the community, she adopts a family of pigs. Brooke is unprepared for the chaos and comfort they bring to her world, or the dashing cowboy who rescues her heart. Solid, dependable Blayne Grundy runs a busy ranch, volunteers on various committees, and takes in stray animals too large to stay at the local animal rescue. Then a chance encounter with a beautiful, beguiling woman leaves him so befuddled, he can barely remember his own name. His predictable organized life is about to be blown away by free-spirited Brooke. A sweet, lighthearted novella, Blown Into Romance highlights the mighty power of love and letting go. Blown Into Romance by Shanna Hatfield is one of ten sweet novellas in the Fall Into Romance collection. Marrying Mandy - Coming Soon! Hi everyone! I'd like to introduce you to my latest book: Marrying Mandy. This is a contemporary marriage of convenience, and it was such a fun book to write! I can't wait for you all to read it. I'm very fortunate to have Victorine E. Lieske with Blue Valley Author Services designing the covers for all my books. Isn't this one just gorgeous? As of now, I don't have a release date, but I'll let you know when I do. Mandy Hudson swore she'd never marry. Abandoned by her parents and raised by her grandparents, she has a hard time trusting that real love will last. When her grandmother dies, Mandy's shocked to discover a stipulation in the will. Considering marriage to her best friend may be the only way to keep her family's beloved bed-and-breakfast. Welcome, Franky! I'm excited to have you on my blog so you can share more about Wired for Romance. I loved the story, and I know everyone else will, too! Franky: I would love to visit Blown Away, because I love blown glass art. Me: Animals are a big part of the stories that make up our Fall Into Romance compilation. Tell us a little about the critter(s) in your novella. Franky: My story, Wired for Romance features a lovable basset hound named Toby. He’s an older dog my heroine, Audrey, adopts because he melts her heart. He naps a lot, tends to moan when he wants something, and sometimes sits down and won’t move in the middle of a walk. But Toby has some secretly stored energy for mischief and he’s ready to defend his home. He is modeled after my 12-year-old basset hound, Samantha. Me: Which of the characters in your story do you relate to the most? Why is that? Franky: Audrey. I also melt at the sad look of a basset hound’s droopy, brown eyes. Me: Which season of the year do you look forward to the most? Franky: I love fall when the weather cools down and it’s time to plant my favorite flower, the pansy. Me: What state do you live in? What’s the weather like there in the fall? Franky: I live in Alabama. In the fall, the brutal summer heat subsides and it cools down, but that doesn’t mean we don’t go back and forth from temperatures in the eighties/nineties then down to 70 the next day. One day it is a nice comfy temp, the next day it’s chilly, then the next day may be hot again and bring severe weather. What we can count on is unpredictable weather, but the heat indexes in the hundreds is over. Me: There are a lot of wonderful pumpkin-flavored treats at the Fall Festival in Romance. Do you like pumpkin? If so, what’s your favorite pumpkin-flavored food? Franky: There are so many delicious pumpkin treats. I love pumpkin bread, pumpkin cookies, pumpkin cake. My favorite is a recipe called Pumpkin Pie Cake. It’s a pumpkin pie filling on the bottom with a butter/pecan/cake mix topping. Franky A. Brown has always called the South home and loves to write about it. She holds an English degree from the University of South Carolina and can't seem to stop reading. She is the author of chick lit and romantic comedy that's as sweet as the chocolate that fuels her writing. He can rewire her house, but he can’t do a thing about the electricity between them…Therapist Audrey Foster thought helping a difficult client through a breakup would be a challenge, but things get out of hand when the electrician she hires is the client's horrible ex-boyfriend. ​Electrician Josh Chadwick needs a big job to pay off some debt and get his mind off women. Rewiring Audrey's house seems perfect, until he finds himself heavily distracted by everything about her, and wondering why she asks so many strange questions. How can Audrey stay professional when she knows so many dark secrets about Josh? And how can Josh convince Audrey, he’s not a bad catch after all? Wired for Romance by Franky A. Brown is one of ten sweet novellas in the Fall Into Romance collection. ​“What kind of man spies on a woman from behind a Christmas tree?” she asked, stopping in front of him and crossing her arms in front of her chest. Her face held a look of suspicious scrutiny. Dumbfounded and caught in the act, Klayne lost the ability to speak. He stared at her another moment before he looked down to his arm where her hand rested. Her palm threatened to sear through the fabric of his shirt and brand his skin. Although he expected her to have soft hands with manicured nails, her hands were work-roughened, chapped, and with nails broken down to the quick. A scab covered the backs of two knuckles and a cut stretched along the length of her index finger. “You’re a quiet one, aren’t you?” she asked, continuing to look at him as she dropped her hand. Me: Romance, Oregon is a beautiful place with a small-town atmosphere and big personalities. If you could visit Romance yourself, what one shop or person would you want to make sure was on your itinerary? J.J. - I think I’d have to go to the roller rink (which appears in “Finding Forever in Romance” and also “Lost in Romance”), if only because I haven’t been to one since high school and (unlike most of my high school years) I have fond memories of that. And of course I’d want to stay at the Interlude Inn. J.J. - Probably Lucas, the hero, because when it comes to relationships, he’s his own worst enemy, and that’s how it always felt to me before I finally met my wife. Me: How many pets do you have? Tell us a little about them. J.J. - Right now, I have one pet (it often feels as though he has me, though!). He’s Danny, a white cat (Domestic medium hair, we think). He’s full of energy and mischief, but he’s also very sweet and unlike our first cat, he loves strangers and will go right up to them. Me: If you haven’t been to Oregon, where would you visit if you could make a trip there? J.J. - Probably my first pick would be Crater Lake National Park. It looks amazing, and it seems like it would be a great experience. Me: What was your favorite part about writing your novella? J.J. - I enjoyed the whole process. It all came pretty easily. As soon as I figured out who my heroine was, her story basically wrote itself. I especially liked working in characters and locations from the other novellas in the set. J.J. - Virginia (specifically northern Virginia, right outside Washington, DC). Fall varies wildly here. Sometimes we don’t really have one – we get summer heat through to mid-October and then straight to winter-like conditions. And sometimes we get fall-like weather from late September right through until Christmas. Me: When you go to a festival or fair, is there a particular type of food you look forward to getting that you don’t usually buy at any other time? J.J. - Funnel cakes! Especially with plenty of sugar and maybe even chocolate drizzled on top. ​J.J. DiBenedetto is author of the Dream Series and the Jane Barnaby Adventures and lives in Arlington, Virginia with the love of his life and a white cat who rules the roost. Dori came to the town of Romance to help a friend. She wasn’t looking for a romance of her own. But when she broke her leg and found herself stuck in Romance for two weeks, romance found her – with the very man who caused her accident. Lucas wasn’t looking for romance, either. But when the woman who almost killed herself by running in front of his truck turned out to be his next client, romance found him, too. Dori has two weeks until her leg is healed and she can travel back home to New York. Lucas has two weeks until his job is finished and he won’t have see Dori again. Can the two of them stop sabotaging themselves long enough for Romance to work its magic on them? Finding Dori by J.J. DiBenedetto is one of ten sweet novellas in the Fall Into Romance collection. Join Us for a 50th Book Release Party! 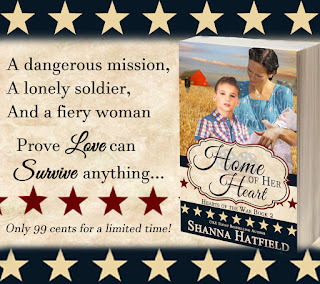 Join me on Thursday, August 10th, for author Shanna Hatfield's Release Party! 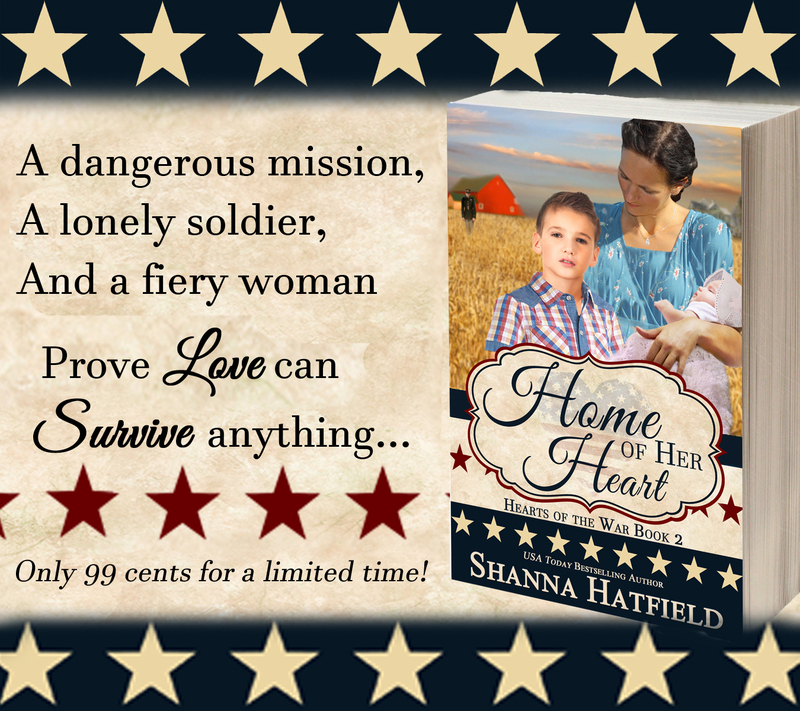 Not only are we celebrating the release of her latest book, Home of Her Heart, but this is also Shanna's 50th title. Both are big reasons to throw a party! ​There'll be prizes, guest authors, games, and much more. You won't want to miss it. Invite your friends and then comment on this post to be entered for a chance to win a $25.00 Amazon gift card! All he needed was a bride. . . The moment she met handsome Sergeant Campbell at a holiday party, Delaney’s whole world shifted off kilter. Full of fun with an unquenchable zest for life, she isn’t afraid to go after what she wants. And what she wants is Klayne. When he prepares to join a hazardous mission, she seizes the opportunity to give him a reason to fight his way back home - to her heart. Author Theresa Lynn Hall's newest title, Ransom in Rio, came out in June. She's here to tell us a little more about herself and her book. Me: Welcome, Theresa. Thanks so much for joining us today. What inspired you to write your newest release? Theresa: My publisher, Pelican Book Group, began a series called Passport to Romance. They posted a list of international cities with a list of three things that had to be written into each book. My husband had recently traveled to Rio on a business trip and I knew that was the book I wanted to write. When you’re reading Ransom in Rio, be on the lookout for an emerald necklace, a formal event, and a family secret. Me: If there’s one thing you hope readers come away with after reading your book, what would it be? Theresa: The one thing I want all readers to come away with is a sense of hope. One of my favorite verses that I live by is Philippians 4:13--I can do all things through Christ who strengthens me. Lexi’s life hasn’t been easy and it only gets harder. She has to learn that there is always hope and she has to find the strength to keep going. Theresa: Oh, my goodness, yes! Coffee and chocolate!! Theresa: I would have to say that I’m in introvert. Even though I’m a teacher, I don’t like to be the center of attention or be in a crowd of people. Unfortunately, I think that with being an introvert comes the self-esteem issues. As much as love to write, I always cringe when I know someone is reading my books. Crazy, I know!! I wish I could be more outgoing, but forcing it doesn’t help much. Once I get to know people, I’m more at ease, but it does take me a while. I completely understand what you mean! I'm also an introvert and struggle with putting myself out there and worrying about what other people think. Theresa: I’m working on a suspense novella set in central Texas. It’s about a young woman who sees something she never should have seen and now is running for her life. The police officer trying to keep her safe is torn between running from his own past and helping her, which puts her in even more danger. I can’t give too much away, but hopefully it will be contracted soon! Theresa: I absolutely love the cover of Ransom in Rio. Nicola Martinez at Pelican Book Group produces the most amazing covers. I sent her a picture my husband took of the Christ the Redeemer statue when he was in Rio and they incorporated it into the cover. It turned out amazing! Me: Thanks again for joining us, Theresa. It’s been fun chatting with you! Theresa: Thank you so much for having me here today, Melanie. I enjoyed it! Book Your Summer Vacation Giveaway! Are you looking for a relaxing way to spend the rest of your summer vacation? How about a collection of 35 books to read? Enter the Book Your Summer Vacation Giveaway and you could win all of the books shown above! Hi Everyone! I could use your help. I've submitted Finding Peace for Christian Women Reader's Club's Literary Lighthouse Award. All submissions are open for voting through August. You don't have to sign up for anything to enter. But if you'd like to register for CWRC's newsletter, you'll be entered for a chance to win a Kindle Fire. If you've read Finding Peace and enjoyed it, I'd really appreciate your vote. I can't begin to tell you what a blessing it's been to work with the wonderful authors involved in the Fall Into Romance collection. I'm going to be chatting with one of these amazing people each week leading up to the release of Fall Into Romance. I hope you enjoy these interviews as much as I have! Hi, Liwen! Your novella, Chasing Romance, is such a fun story. I can't wait for everyone to meet Izzy and Chase! Liwen: Great question! After researching Oregon for my story and also reading some of the other stories in the set, I almost feel like Romance is a real place. J If I could visit this small town, I’d definitely want to meet Mrs. Cooper, the all-too-helpful and curious neighbor from my book. She was such a fun character to write. She also wins the pumpkin pie contest every year at the Fall Festival, so I’d have to try a slice of her pie. Me: Animals are a big part of the stories that make up our Fall Into Romance compilation. Tell us a little about the critter in your novella. Liwen: The animal friend in my story is a black lab/pit bull mix named Thor. He’s actually based off the dog my sister and brother-in-law adopted two years ago whom I lovingly refer to as my fur-nephew. He’s a sweet dog with the softest, velvety ears. Liwen: This is a hard one. I think I’d have to say the female main character, Izzy, only because she’s a songwriter and I used to write song lyrics back in the day. A couple of college friends and I wrote a song together that became the official song for our church’s college group. I heard they were still singing the song years after we graduated! Bonus fact: I let my inner songwriter loose again when I wrote this story and included some song lyrics. Unfortunately, I don’t write music, but if there’s someone who wants to put the words to a melody, I’d be thrilled! Me: What’s your favorite snack food or drink to have on hand when you’re writing? Liwen: I always drink tea when I write. During the colder months, I drink chai or peppermint tea; during the warmer months, I like something more fruity and sweet. When I splurge on tea, it’s usually from a local boba place that sells tea with toppings (my favorite is crystal boba, which is also known as white boba). Liwen: My favorite part about writing this story was getting inspiration from music. I based the male main character off a real artist, Shawn Mendes, who’s a bit younger than Chase, but is just as passionate and charming. I listened to his songs non-stop and even watched interviews of him online so I could get a good sense of who he is. If you haven’t heard of him or his songs, you need to check him out! Me: What about writing your novella was the most challenging? Liwen: The most challenging part was writing about a relationship between a younger man and an older woman. I have no experience in this area, but I did ask my hubby for a male perspective and also researched some celebrity couples who are in similar relationships. (Hugh Jackman and Deborra-Lee Furness are a great example of one). Me: If you had to describe the town of Romance with one word, what would it be? Liwen: Familiar. Familiar because it’s a small town and everyone knows everyone else, but also because the people who live there are like the people you’d meet in your town/city. Liwen Y. Ho works as a chauffeur and referee by day (AKA being a stay at home mom) and a romance writer by night. In her pre-author life, she received a Masters degree in Marriage and Family Therapy from Western Seminary, and she loves makeovers of all kinds, especially those of the heart and mind. She lives in the San Francisco Bay Area with her techie husband and their two children, and blogs about her adventures as a recovering perfectionist atwww.2square2behip.com. Izzy Sutton shelved away her own needs when her ex-boyfriend left town eighteen years ago, leaving her to raise their daughter alone. With Gracie away at college now, she has time to invest in her Bed and Breakfast, as well as her secret job as a songwriter. Trouble starts though when a handsome singer comes looking for a room, forcing Izzy to decide if it’s worth opening up her heart again, especially to a much younger man. Pop sensation Chase Lockhart owes his overnight fame to one song penned by an anonymous writer. Desperate for more chart-toppers, he travels to Oregon to collect the other songs she owes him. Finding her is the least of his troubles; getting past her defenses, including her dog who hates him, proves to be the real challenge. Can a shared love of music lead a young singer and a single mom to fall in love? Anything’s possible in the small town of Romance. Chasing Romance by Liwen Y. Ho is one of ten sweet novellas in the Fall Into Romance collection. Get Ready to Fall Into Romance! What happens when you mix together a group of authors, add laughter, lovable pets, and a dash of pumpkin spice? The perfect combination resulting in ten sweet novellas that'll have you falling in love all over again! We can't begin to tell you how much fun we've had working together on this project. It's our hope that you'll fall in love with Romance, Oregon and the people who live there just like we did! Like and follow us on Facebook! You'll stay up-to-date on release news, author interviews, future projects, and more! Being a part of this boxed set has been an amazing experience and a blessing. My novella, Finding Forever in Romance, was so much fun to write and I can’t wait for you all to read it! From the time he was a child, Brent Todd has helped lost pets find healing and homes. Now, he runs Romance's Finding Forever Animal Rescue. Amid the dogs, cats, donkeys, goats, and exotic animals in his care, he convinces himself he has everything he needs. Then a beautiful woman and her son volunteer to help at the shelter. Brent soon realizes he needs more than the rescue animals to fill the empty spaces in his heart and home. Dedicated to raising her son, Nicole Crawford views romance as a lovely idea. But between being a single mom and the pain of her past, she refuses to dwell on something so out of reach. To teach her son about helping others, they volunteer at Finding Forever on a temporary basis. But the more time she spends with Brent, the more she realizes it'll be impossible to walk away from him and the shelter with her heart intact. Together, maybe Brent and Nicole will discover a forever family of their own. Don't forget to pre-order your copy of Fall Into Romance!